In an effort to reach out to our next generation of cooperators, this year’s Annual Meeting will have more family-friendly features than ever before! We’ve moved the event to earlier in the day so youngsters can participate in the new and exciting activities we’re planning. Join your fellow AFC owner families for an intergenerational celebration of summer and cooperation! Because this is our required Annual Meeting as well as a joyful event, you will also have a chance to hear short reports from our Board and General Manager as well as meet our newly elected board members. Enjoy Lithia Park and its lovely trails and awesome playground area with your family both before and after our event. Meal service starts right at 11am and closes at noon. The menu will be totally new and is designed to appeal to children and adults alike. Since we’ll be eating at midday, it will be more like picnic fare, rather than a heavy meal. Look for more information on our website and in the store beginning in early June. 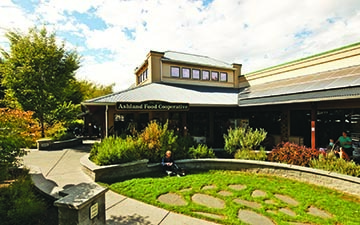 Please join us to catch up with old friends, meet new ones, discover new playmates, and find out what Ashland Food Co-op has been up to for the past year! We’re striving for a Zero Waste event. Bring your own durable plates, eating utensils, cups and reusable napkins to make this happen. We will not provide any paper goods at the picnic. The food line opens at 11am. Food service will end at 12pm sharp. There are 200 food tickets available. A $5 donation will get you a ticket for adults and children age 11 and up. Meal tickets for children 10 and under will be $1. All tickets are on a first come first served basis beginning Monday, June 6th. Your donation will go to the Ashland Food Co-op Community Fund, housed by the Twin Pines Foundation. You may purchase and pay for tickets at the Info Desk up until 4pm Friday, June 24. No food tickets will be available at the event. Our menu will consist of a variety of foods to accommodate most dietary needs and all ages. If you have very restricted or complicated dietary restrictions, please bring your own picnic. If you would like to help with this year’s Annual Meeting, we would love to hear from you. Contact Gretchen Phillips for more information: 541-552-5454.